Brookland is a neighborhood in northeast Washington DC. 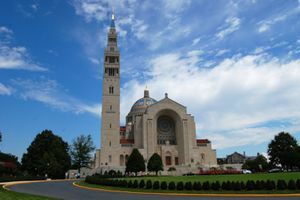 The major attraction in Brookland centers around Catholic University, sometimes known as the "Little Vatican" for all its major Catholic institutions, as well as the National Shrine. 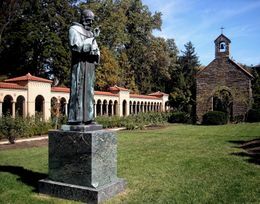 In 1887, the Roman Catholic Church purchased land as the site for The Catholic University of America (CUA). The presence of Catholic University attracted many other Catholic organizations and institutions to the area. The neighborhood is named after Colonel Jehiel Brooks, who acquired 150-acres in the area via his marriage to Ann Margaret Queen, daughter of prominent Marylander Nicholas Louis (Lewis) Queen. For more information on riding the Metrorail in Washington DC, see Washington DC#Get_around. The Red line stops at Brookland-CUA. The following are the main bus routes operating in this area, along with links to timetables and route maps. For more information on riding buses in Washington DC, see Washington DC#Get_around. G8 operates through Brookland to Metrorail stations in Shaw and the West End. H8 operates through Brookland to Metrorail stations in Petworth and Columbia Heights. There are several fast casual restaurants such as Chipotle, Potbelly's, & Pizza, and Chick-fil-a between the Metrorail station and Catholic University. Most restaurants and cafes offer free WiFi. This page was last edited on 23 November 2018, at 22:23.